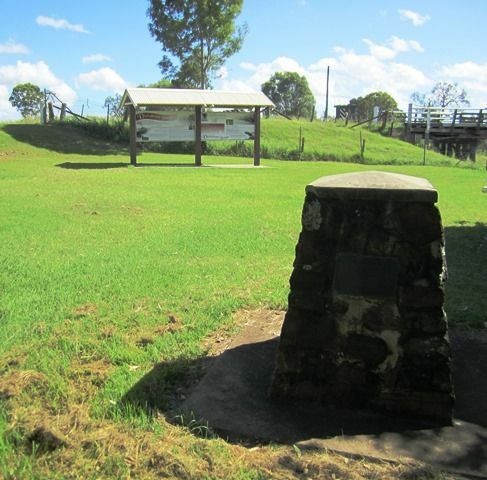 A memorial commemorates the centenary of the construction of the Dickabram Bridge, which is a road and rail bridge over the Mary River. It was the major bridge on the Kingaroy line. The heritage listed bridge is one of only two remaining road and rail bridges in Australia and the only one in Queensland. It is the oldest remaining large steel truss bridge constructed in Queensland. The steel and timber truss bridge, built by McDermott Owen & Co., was completed in November 1886 and the line opened for traffic between Dickabram and Kilkivan on 6 December 1886. It is 191 metres long and stands 23 metres above the Mary River. All spans are metal trusses except for the 11 metre approach spans which are tied timber girders. The two river piers are cast iron cylinders; the remaining piers and road deck are timber. This plaque was erected on 12th October 1986, as an Australian Bicentenary project to commemorate the historical significance and the Centenary of the Dickabram Bridge. The cost of this structure was £14.082 - 18s - 3d.